I was excited to try out some new footwear for fall/winter since we actually get snow here. 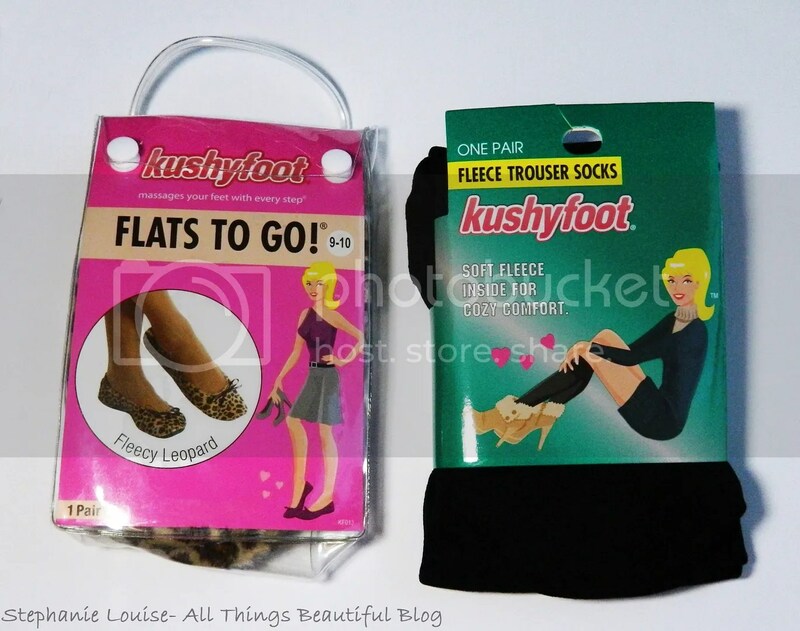 Kushyfoot sent me one pair of their Fleece Trouser Socks & a pair of their Fleecy Leopard Flats to Go. Keep reading to see if these might be perfect for you or to give as a gift this chilly season. Honestly I liked one pair & didn’t so much like the other. Sad face. But first let’s talk about the product I really do like! From Kushyfoot- Ultra soft fleece tights give you total opaque coverage so you can brave even the coldest of days. Perfect to wear under your favorite boots! I think these tight/socks hybrid are a really cool idea. On the outside you see opaque black tights (only to below the knee) but on the inside there is a thin layer of very soft fleece. I really like that they look professional on the outside & don’t great odd bulges if you wanted to wear them under skinny jeans or slacks. They aren’t thick so they didn’t make my shoes feel tight. All in all, a well thought out product perfect if your feet get a bit chilly during cooler months. 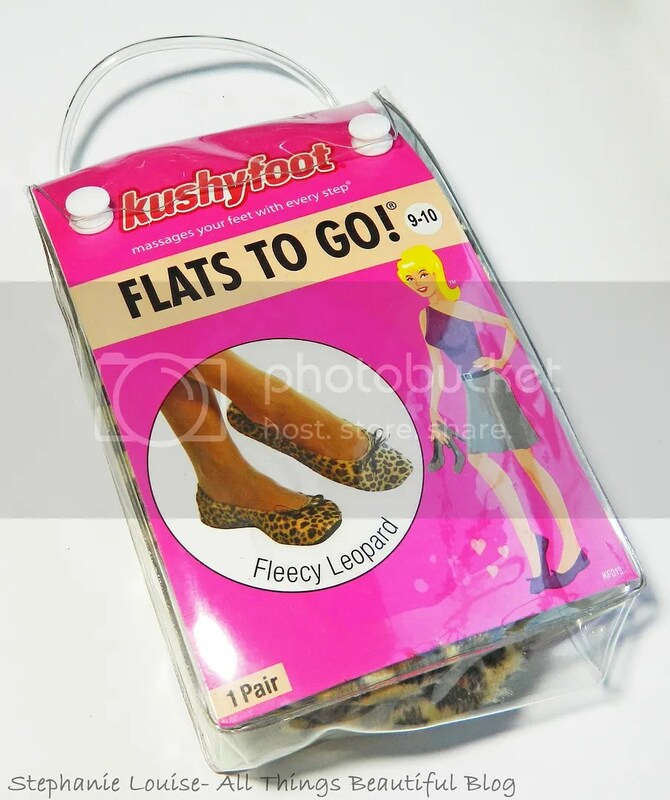 From Kushyfoot- Fleecy leopard Flats to Go® are the newest addition to our Fall 2012/Winter 2013 collection. These lightweight and ultra portable flats have a soft sole which allows them to be rolled up or folded so that you can tote them in your purse ready for any potential shoe emergency. Designed for indoor use and occasionally on smooth outdoor surfaces. Great for travel too! For me these just weren’t what I was expecting.For one thing, I got the 8-10 because I normally wear around an 8 1/2 & they’re way too big. The elastic on the heel feels really flimsy & doesn’t always stay on my foot. Bummer. My biggest complaint is that I would assume these would be flats I could throw on when my heels start hurting but you can only use them “occasionally on smooth outdoor surfaces”. So basically they’re house slippers? The bow on the top makes them look more like slippers as well, not something I’d rock in an office environment. My biggest worry is that the material on the bottom is SO thin that they feel like they might break any minute. In fact they’re so thin that I could feel the cold concrete (a flat, even outdoor surface mind you) & yikes was that a shock to my system. No wonder they don’t want me wearing these slipper socks outside! It is nice they come with a case & they are indeed thin but I don’t think I have a use for them personally. If I’m going to rock slippers I’ll wear slipper socks inside & wear something with some kind of sole to take the dogs out if need be. Plus. Again. They didn’t really stay on my feet anyway. I think I’ll keep them in the trunk of my car in case I desperately need to change shoes or don’t want to drive in heels. Then again…I could also throw some cute flats in the back of my car & not feel like I’m wearing cheap slippers. 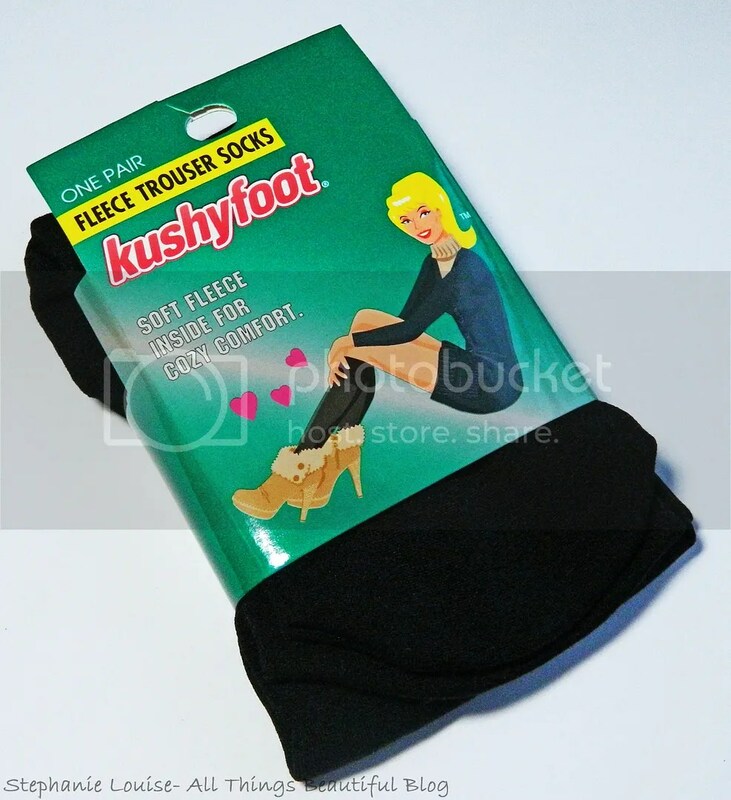 You can purchase both of these items from the Kushyfoot website here. What do you think of these products? What kind of socks do you wear with your boots or pull out in the cooler months?